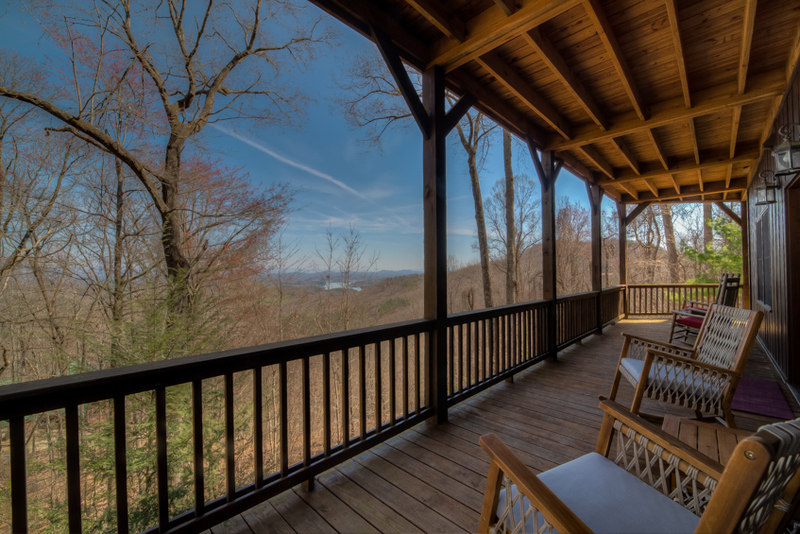 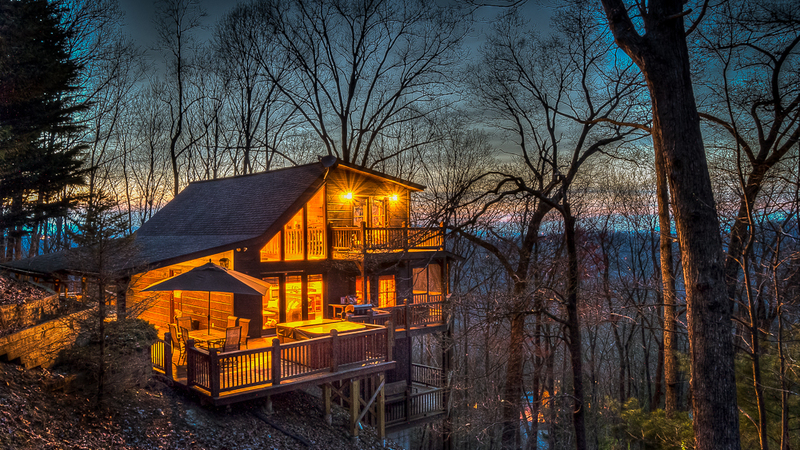 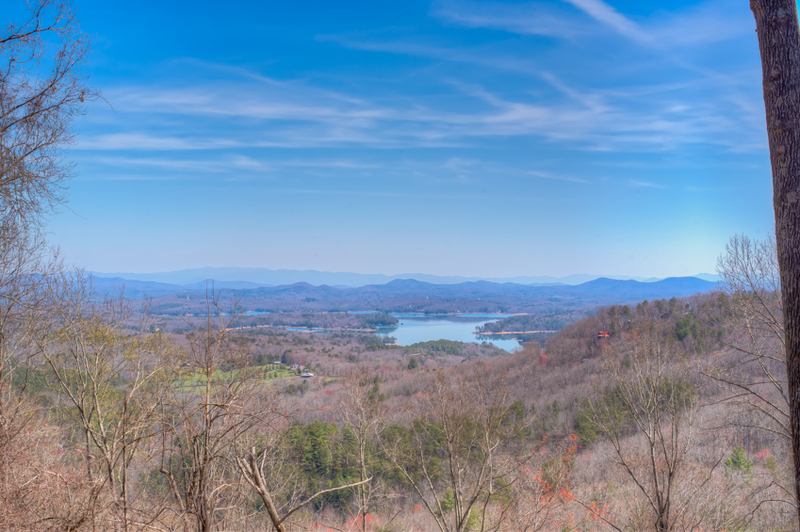 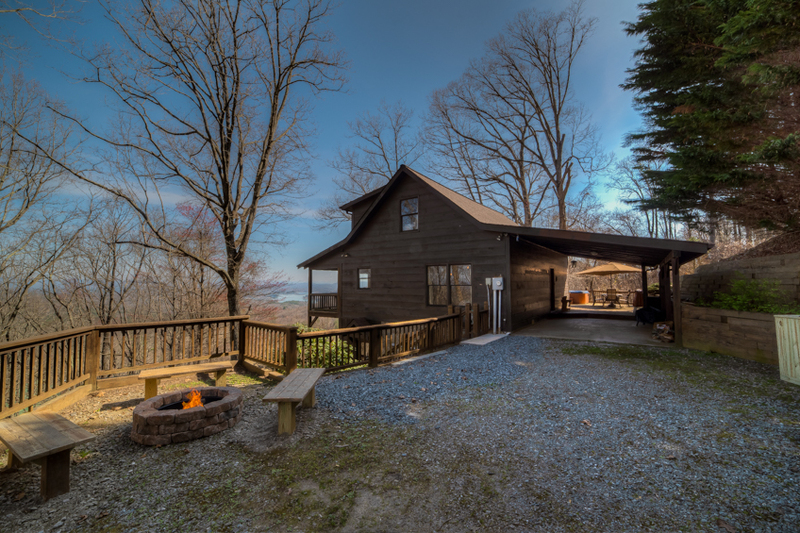 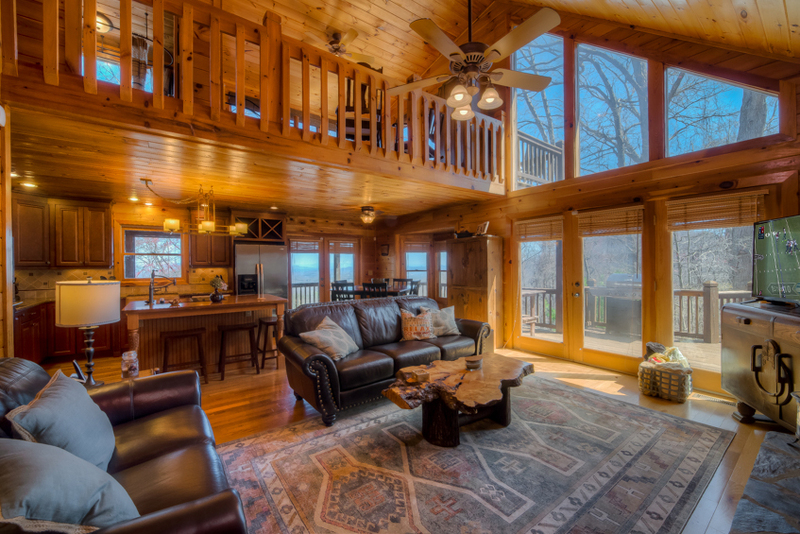 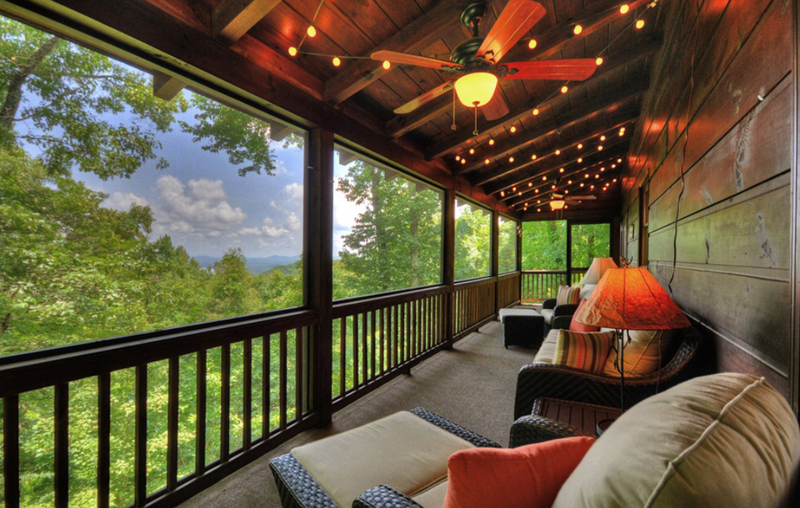 Aptly named for its perfectly situated location above the Blue Ridge Mountains and Lake Blue Ridge, the North Georgia cabin rental Above the Blue is all about its million-dollar view. 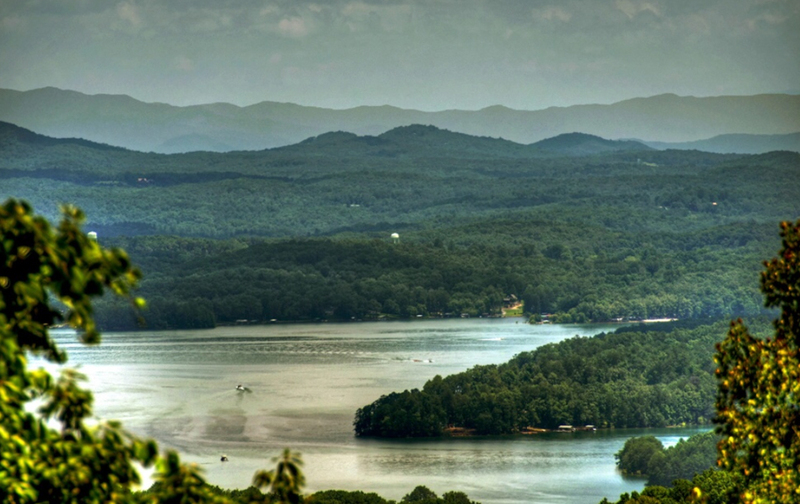 Breathtaking, magnificent, and stunning are words you might use to describe its spectacular sunrise-to-sunset picture postcard vistas, if you’re not rendered completely speechless by nature’s beauty. 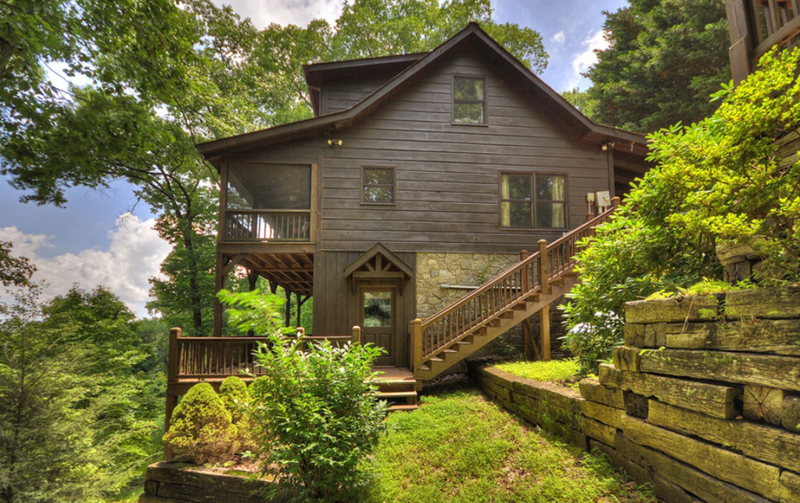 This private, wooded oasis is convenient to popular attractions like Falls Creek Falls, the Swinging Bridge on the Toccoa River, and of course Lake Blue Ridge, and the shops and restaurants of Blue Ridge are just five miles away. 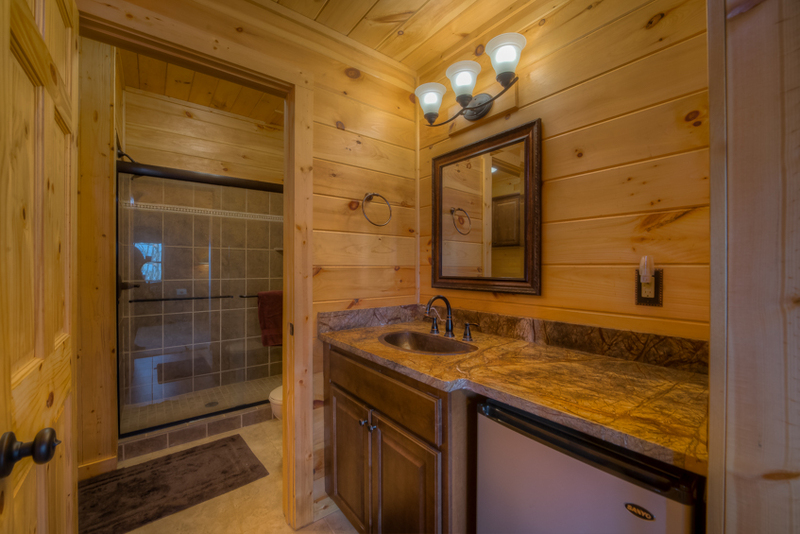 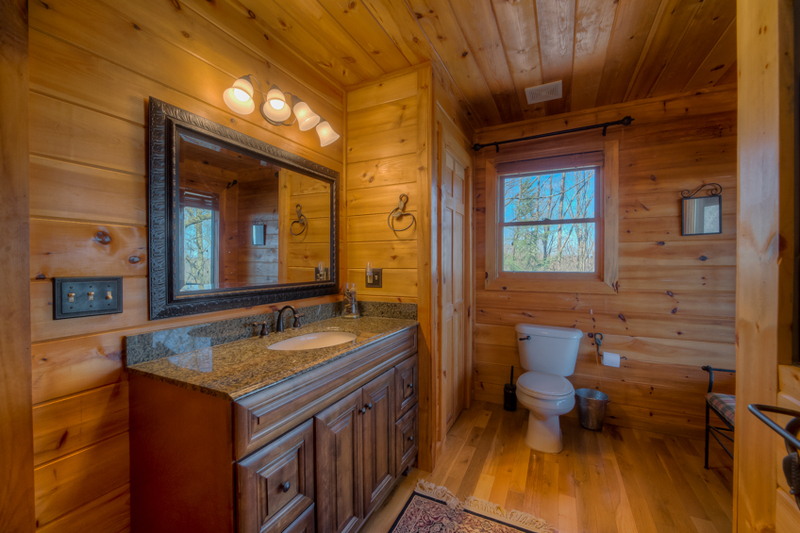 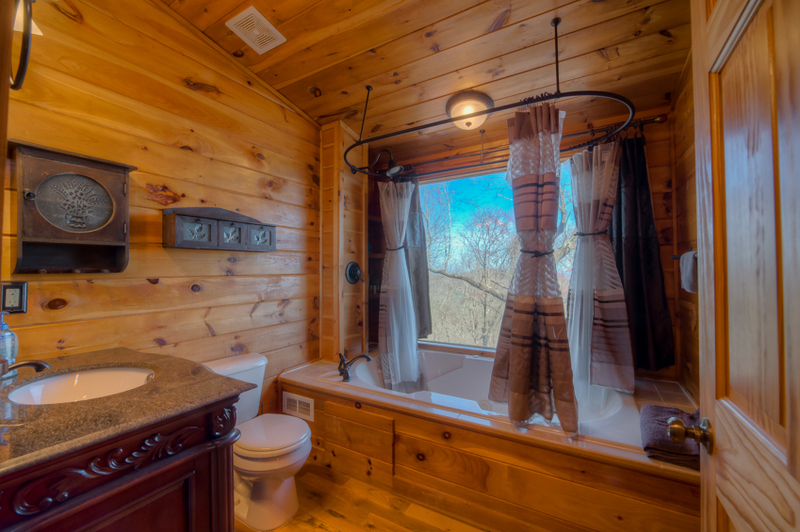 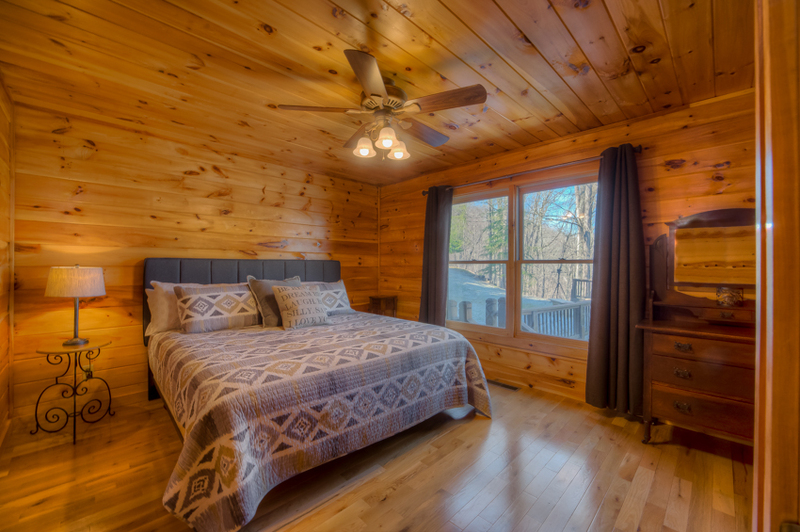 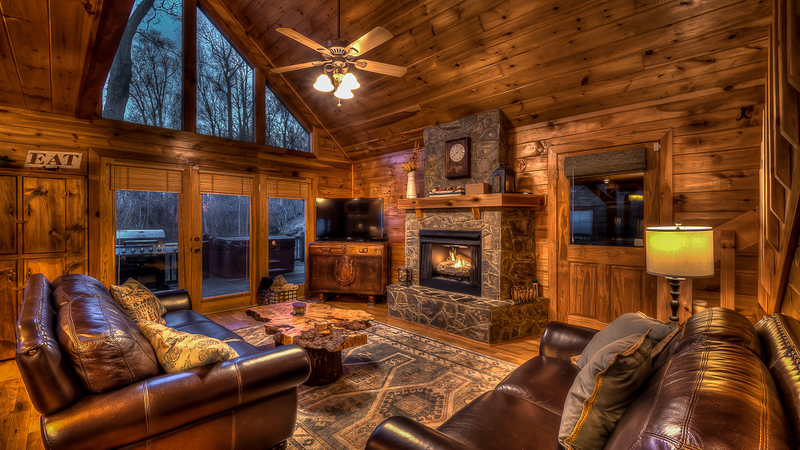 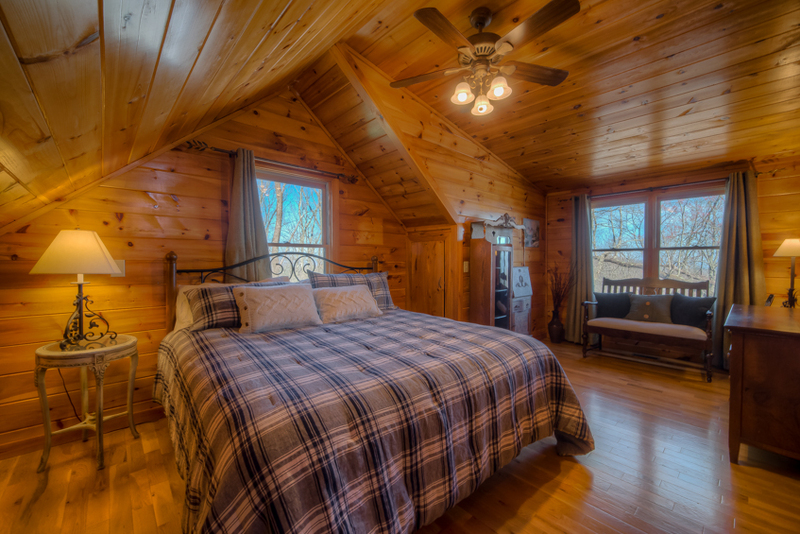 Constructed of the finest pine and furnished in modern rustic style, the tri-level cabin is warm and inviting, the perfect place to relax, unwind and enjoy a carefree experience with friends and family. 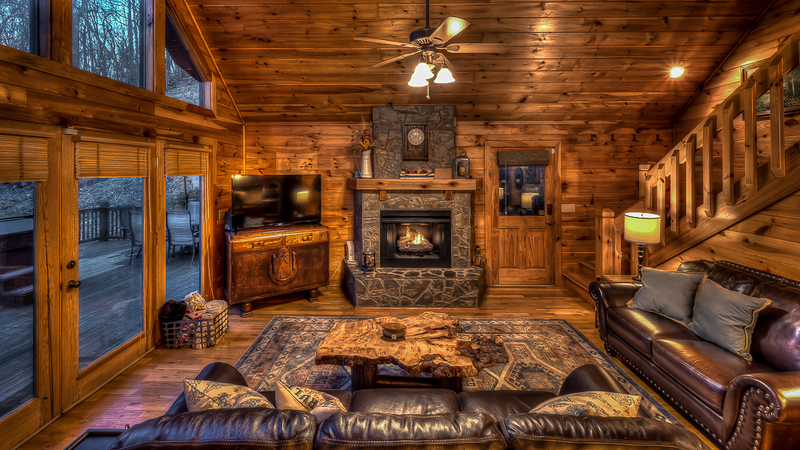 On the main level, the living room is beautifully appointed with leather sofas, a gas stone fireplace, an unusual tree trunk slab table and a 50” TV. 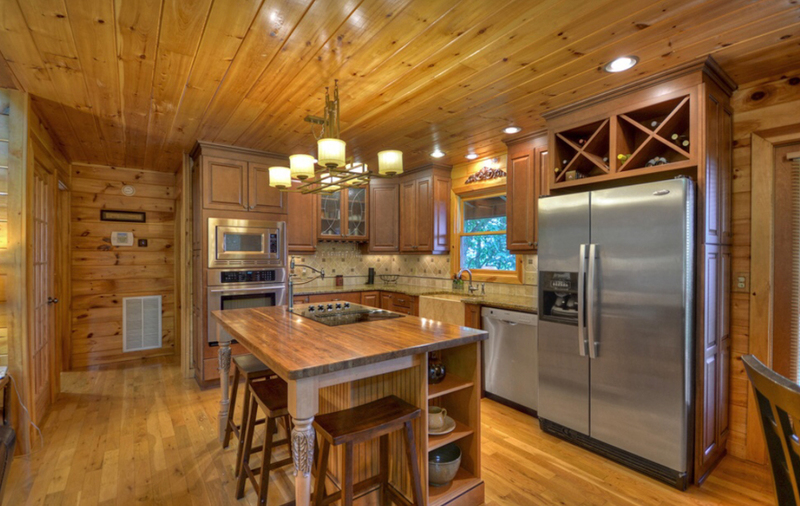 The spacious kitchen is a chef’s dream, outfitted with solid wood cabinets, stainless steel appliances, electric stove and oven, custom granite countertops, a wine rack, icemaker, crockpot, and drip coffeemaker. 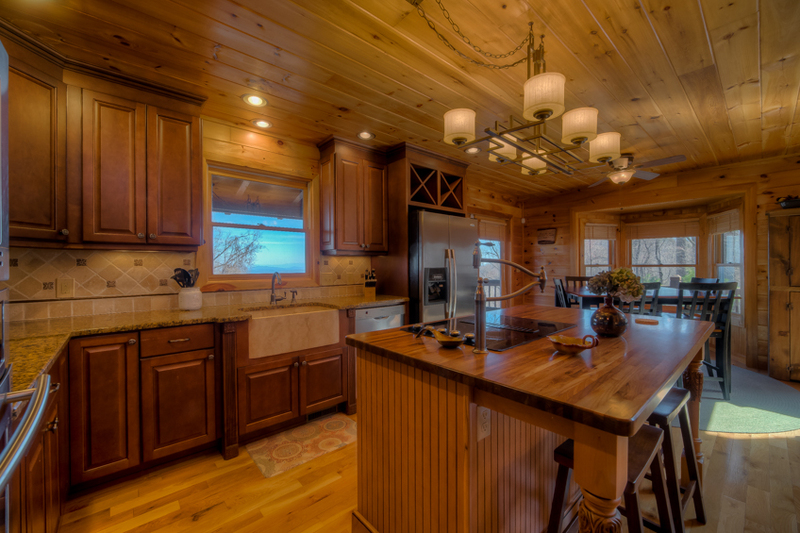 The dining table seats six, plus three at the kitchen island. 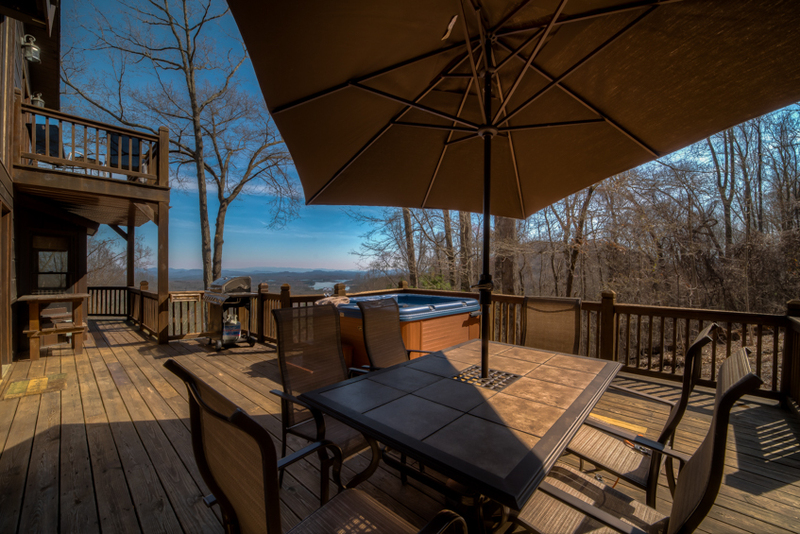 Or you can fire up the gas grill and dine on the screened-in deck, where you’ll find a six-seat umbrella table. 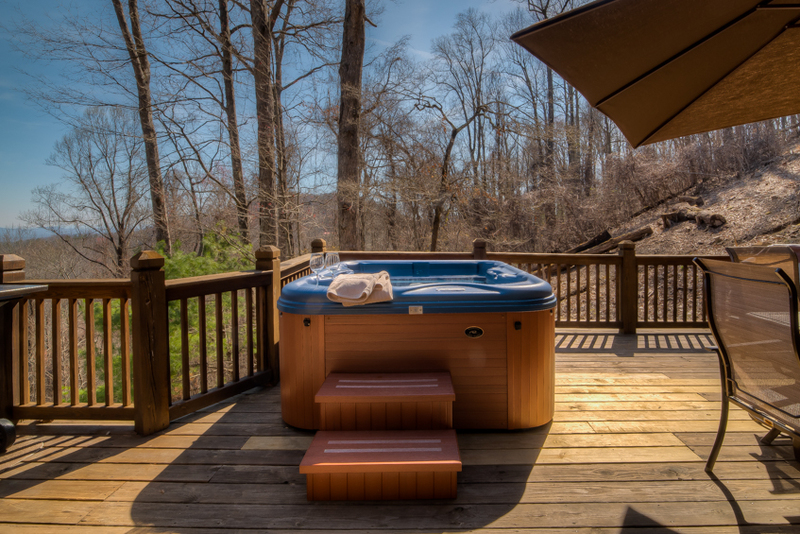 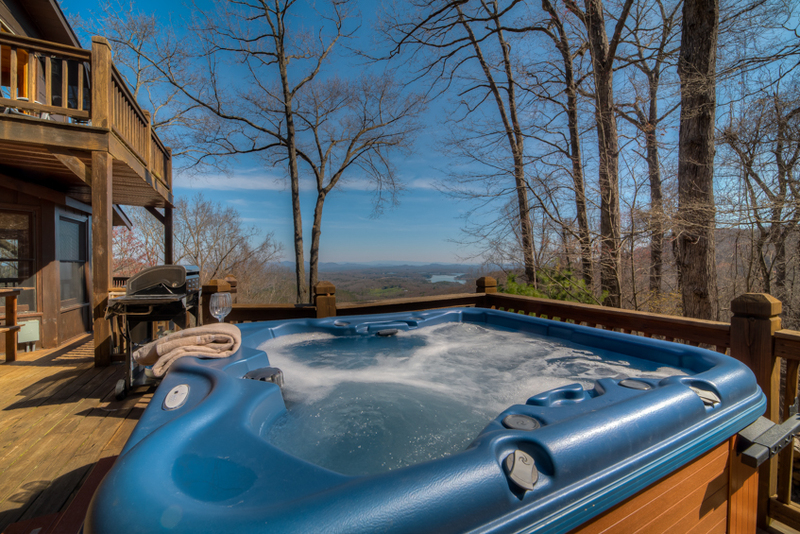 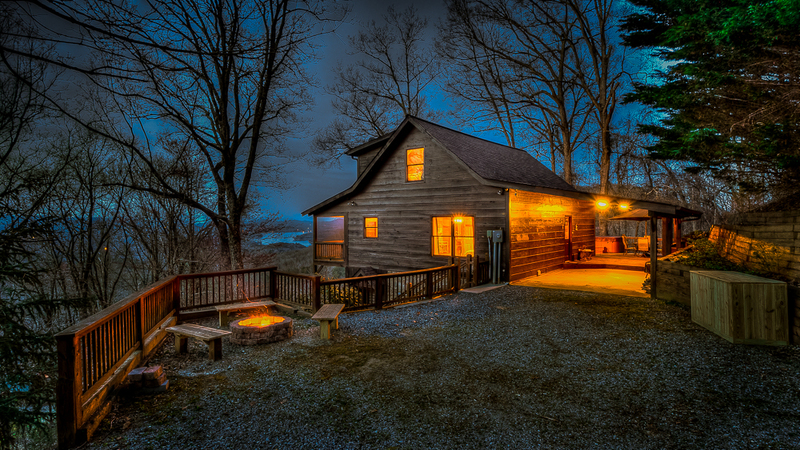 There’s a hot tub with room for five, overlooking the lake and mountains, and a fire pit next to the house for your marshmallow roasting pleasure. 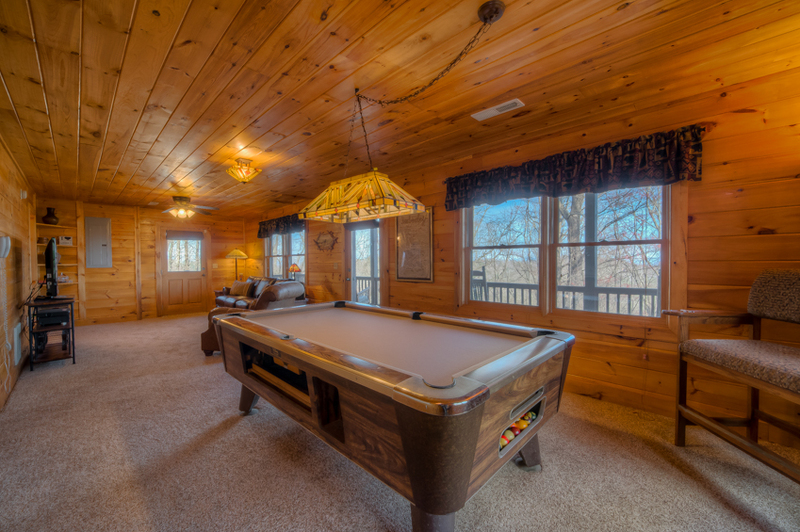 For indoor fun, you’ll find a pool table and 48” TV with DVD in the game room on the lower level. 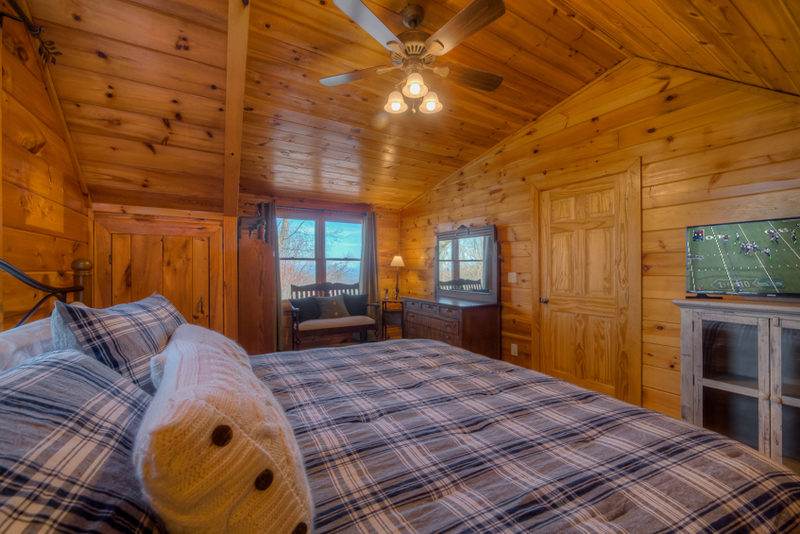 You’ll slumber in comfort in the bedrooms located on each level, plus a twin daybed in the upper level loft. 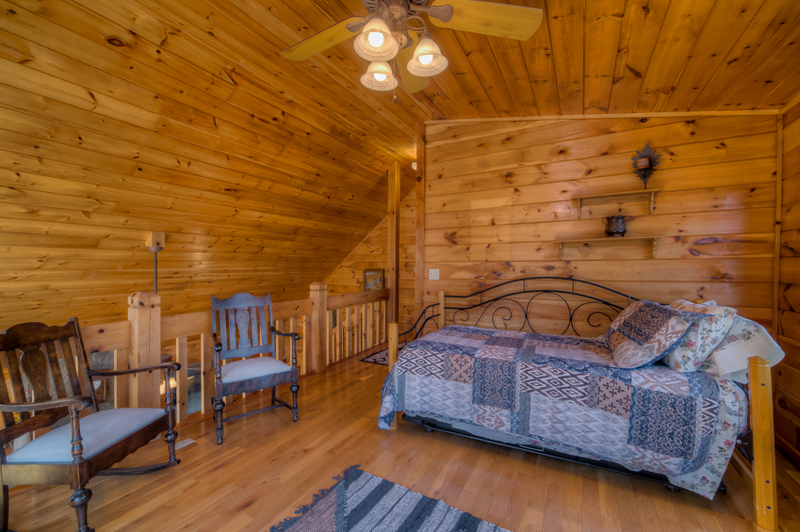 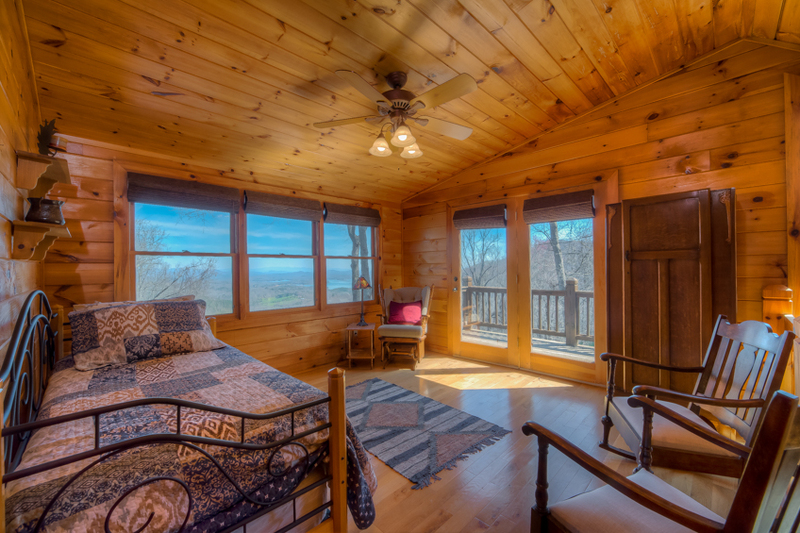 The upstairs master bedroom features a king bed, a sitting area, deck access, and 40” TV. 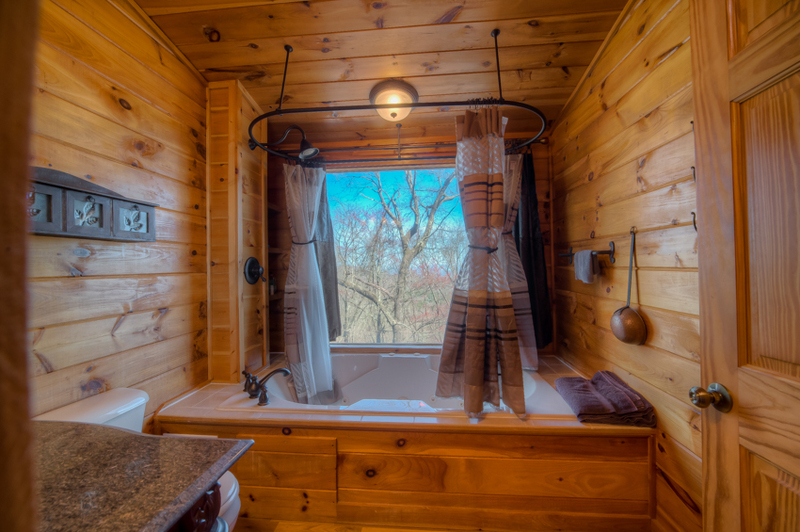 Its separate bath has a Jacuzzi tub/shower combo and a picture window framing the view. 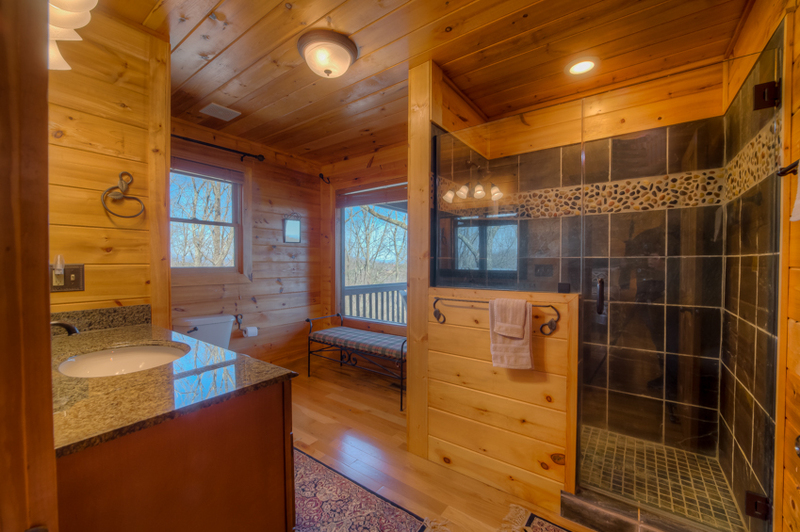 The main level bedroom also has a king bed, and its adjacent bathroom has a walk-in tiled shower, as does the lower level bath. 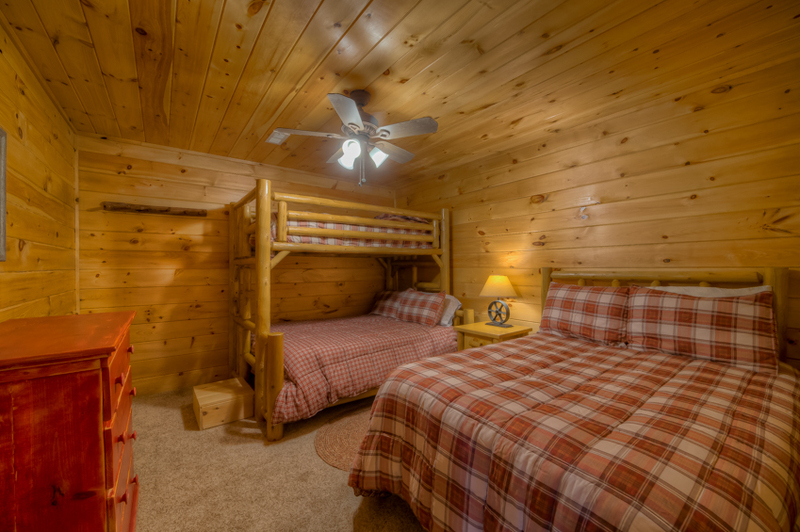 The third bedroom, furnished with double and bunk beds, is ideal for kids. 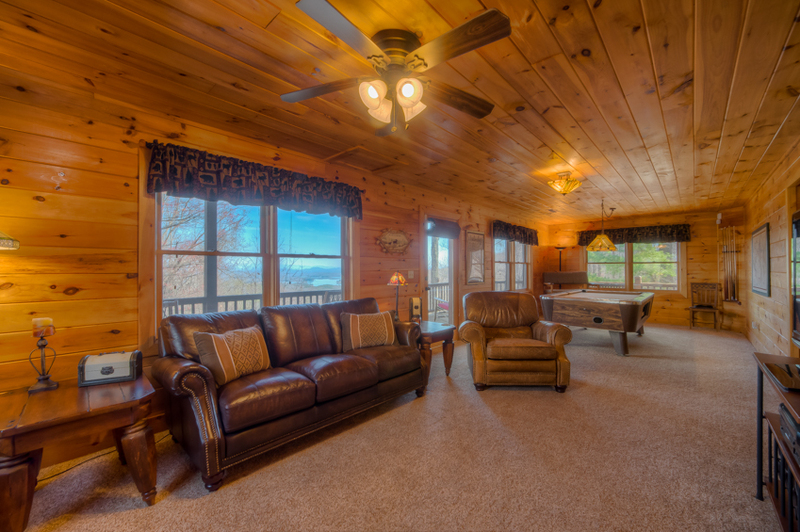 Above the Blue’s additional amenities include WiFi, Dish Network, ceiling fans in all rooms, a washer/dryer on the lower level, and a gravel driveway with carport. 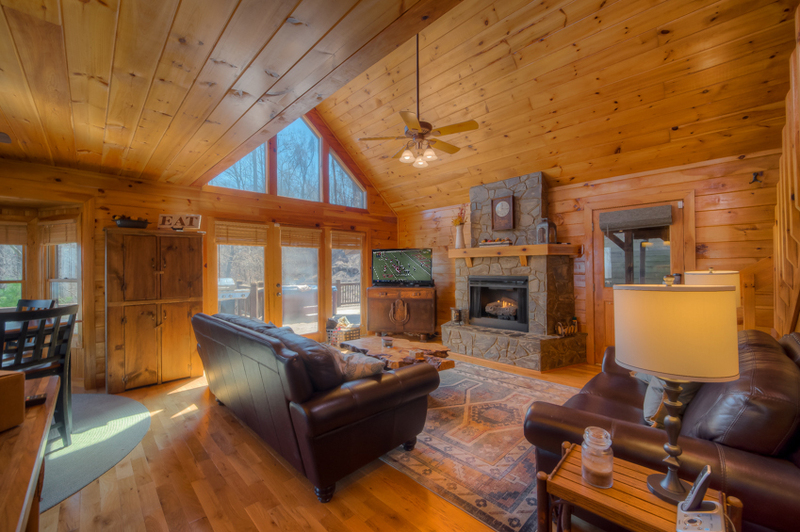 It’s pet-friendly, so feel free to bring your dog with you to relax, celebrate, and enjoy the mountain vacation of your dreams.